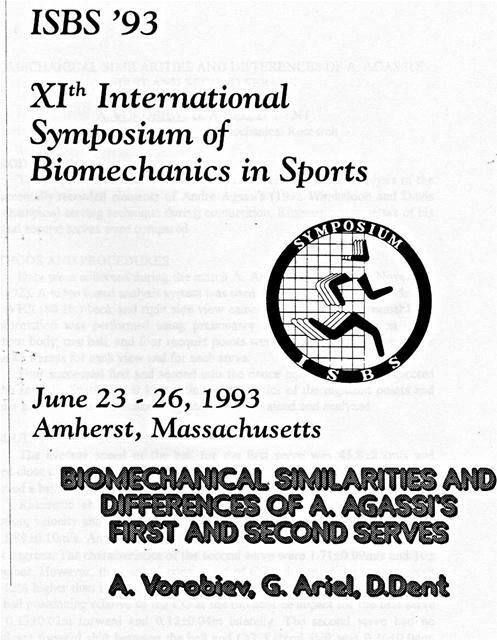 The purpose of this study was to perform three-dimensional analysis of the instrumentally recorded elements of Andre Agassi's (1992 Wimbeldon and Davis Cup champion) serving technique during competition. Kinematic parameters of his first and second serves were compared. 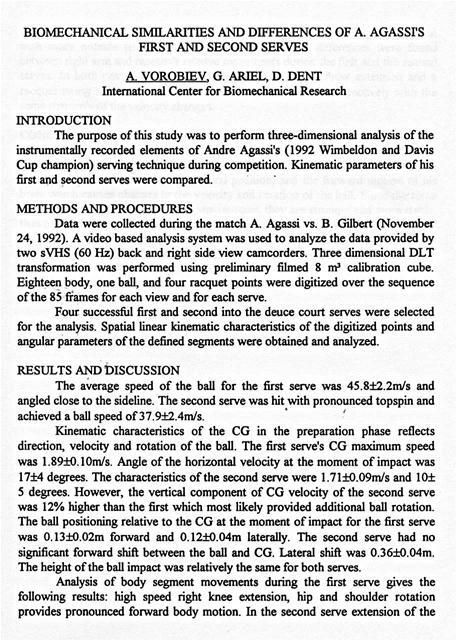 Data were collected during the match A. Agassi vs. B. Gilbert (November 24, 1992). A video based analysis system was used to analyze the data provided by two sVHS (60 Hz) back and right side view camcorders. Three dimensional DLT transformation was performed using preliminary filmed 8 m3 calibration cube. Eighteen body, one ball, and four racquet points were digitized over the sequence of the 85 frames for each view and for each serve. Four successful first and second into the deuce court serves were selected for the analysis. Spatial linear kinematic characteristics of the digitized points and angular parameters of the defined segments were obtained and analyzed. significant forward shift between the ball and CG. Lateral shift was 0.36ï¿½0.04m. The height of the ball impact was relatively the same for both serves. left knee was dominant with less influence by the hip and shoulder rotation, but with more notable lateral trunk action. No significant differences were found between right arm and racquet's relative movements during the first and the second serves. In both cases maximum angular velocities of the elbow extension and a racquet swing were 1185ï¿½110 deg/s and 3240ï¿½180 deg/sec respectively with the same structure of the velocity changes. 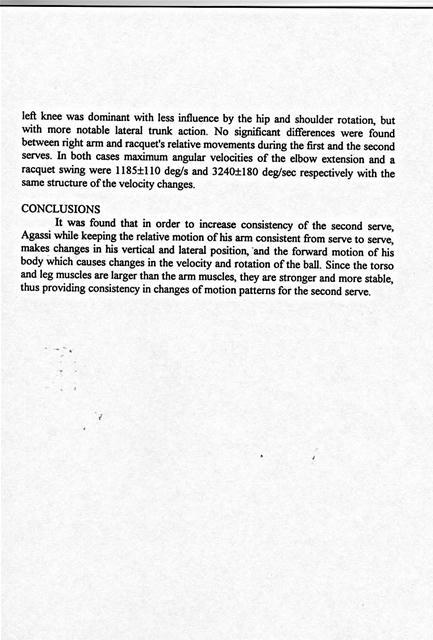 It was found that in order to increase consistency of the second serve, Agassi while keeping the relative motion of his arm consistent from serve to serve, makes changes in his vertical and lateral position, "and the forward motion of his body which causes changes in the velocity and rotation of the ball. Since the torso and leg muscles are larger than the arm muscles, they are stronger and more stable, thus providing consistency in changes of motion patterns for the second serve. Generated on 4/22/2019 10:59:17 AM (PST) ADI/HQ/GBA/2019/ARIELCLOUD/v3.0.2018.0126.